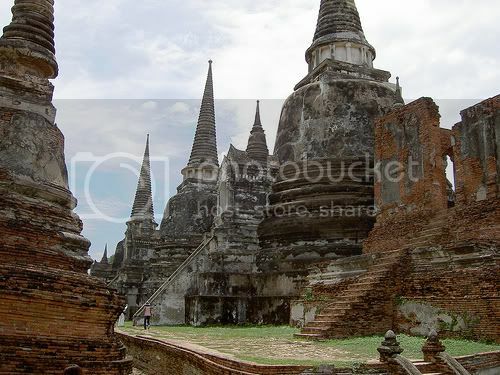 17 October 2007 (Bangkok Post, Nation Multimedia) – The ruins of Thailand’s ancient kingdom of Ayutthaya is in danger of losing its UNESCO World Heritage Status, because of encroachment into the historic city by urbanization. One of the longest-running kingdoms in Thai history, Ayutthaya ruled between the 14th and 18th century, and finally fell to a Burmese invasion in the middle of the 18th century. Today, Ayutthaya is one of the highlights for Thailand tourism. Culture Minister Khunying Khaisri Sriaroon said Wednesday it would be “unfortunate and embarrassing” if Unesco removes the Historic City of Ayutthaya and Associated Historic Towns from the World Heritage list after the site was under threat of land encroachments from rapid development. Khaisri had received an initial report from the Fine Arts Department claiming the site, inscribed on Unesco’s World Heritage List in December 1991, had problems with city planning that might lead to the site being removed from the list, the minister said. Ayutthaya was also deemed a world heritage with the most problems with land encroachments, which was now beyond Fine Arts Department officials’ control, Khaisri said. The ministry will now ask for cooperation from the Ayutthaya Governor to ensure the site was maintained according to the Unesco criteria, she added. If the site was not taken care of or kept in good condition and was removed from the list, it would be unfortunate and embarrassing, she said. It would show that the Thais did not see the importance of their cultural heritage, while other countries were striving hard to have their cultural sites included on the Unesco World Heritage list, according to Khaisri. The best group to take care of the Historic City of Ayutthaya and Associated Historic Towns was the local communities who could keep a close watch on anything suspicious, she urged. Fine Arts Department DirectorGeneral Kriengkrai Sampatchalit said that the Unesco World Heritage Committee would inspect the ancient sites on the list to see how they were being maintained. He said that he had learned that the committee was considering grading the heritage site according to a colour code. The colour code comprised red, meaning the site was at risk of being removed from the list; yellow, meaning the site needs improvements, while green meant the site is in good condition, he said. He urged that the existing problems could still be solved and he would soon discuss with all sides to end the problems. Fine Arts Office 3 director Anek Sihamat said the site’s inner area covering 1,800 rai – out of the total 6,000 rai where many of important historical places such as Wat Phra Sri Sanpetch and Wat Ratcha Burana were situated – now had people building structures over these ancient sites. He cited as an example a lawsuit between his office and the local administration body and residents over an overeightmetretall building that resulted in construction’s cancellation. However, such problems only affected around 10 per cent of the site’s area. If they accounted for 40 to 50 per cent, then it would be worrying and might lead to it being removed from the list, he said. Citing the time before the site’s inclusion to the Unesco list when there were many land encroachments, Anek said the authorities solved the problems and had managed the area according to the Unesco criteria, including moving an 11metre building to outside the urban area and having state agencies’ offices located to a new city area. Earlier, Chao Sam Phraya Museum Director Subongkot Thongthongtip, said the site’s problems resulted from no proper control over the city planning, which recently allowed high buildings to be built near the world heritage site, and urged that planning laws be strictly reinforced. Subongkot said that she personally disbelieved a rumour that the site would be removed from the list because the Unesco World Heritage regularly assess the site and would warn the authority to improve matters before it would remove the site from the list. The historic city of Ayutthaya might lose its World Heritage status, as poor zoning plans lead to more land encroachment in the protected zone, Culture Minister Khaisri Sri-aroon said yesterday. A survey of the protected area will be sent to the World Heritage Committee, which is appointed by the United Nations Educational, Scientific, and Cultural Organisation (Unesco). The committee suggests new cultural heritage sites around the world or removes those that fail to meet its criteria from the list. Ayutthaya’s Word Heritage status was now at risk, Khunying Khaisri said, as the city was threatened by urbanisation which led to more construction in its old zone. The city of Ayutthaya, capital of the then Siam, was made a World Heritage site in 1991. She said the Fine Arts Department, which oversees archaeological sites, lacked the power to tackle encroachers, who managed to build in prohibited areas. Previous Post: Cambodia aims to vent some tourist pressure through designated routes.